In addition to the great stress that incarceration places on the marital bond, it also negatively affects parenting efficacy and child development. 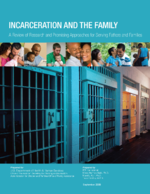 Based on qualitative and cross-sectional quantitative studies, children of incarcerated parents appear more likely to experience a range of negative outcomes than children of similar socioeconomic backgrounds who do not have an incarcerated parent. Pathways for these effects remain unclear; however, a preliminary theoretical model articulated in Parke and Clarke-Stewart’s (2001) meta-analysis proposes that incarceration weakens parent-child bonds, leading to insecure attachment, diminished cognitive abilities, and weak relationships with peers. Because much existing research on the impact of parent imprisonment on child development is not specific to fathers, we draw on studies that investigated the influence of mother involvement in the criminal justice system as well. Children of incarcerated parents are more likely to experience internalizing disorders and to exhibit behavioral problems than their peers (Jose-Kampfner, 1995; Baunach, 1985). Based on a qualitative study of 30 children who had witnessed the arrest of their mothers, Jose-Kampfner (1995) posited that the high levels of anxiety and depression found among participants were associated with the experience of maternal incarceration and with trauma related to the arrest event itself. In her sample of 56 mothers incarcerated at women’s prisons in Kentucky and Washington State and their children, Baunach (1985) found that 70% of the children exhibited symptoms of social and psychological disorders, such as aggression, hostility, and withdrawal. Preliminary research suggests that children with incarcerated parents may exhibit a range of academic problems, including poor grades, behavior problems, and school phobias at higher rates than children of nonincarcerated parents. Stanton (1980) compiled quantitative measures of childhood well-being for 166 children ages 6 and under whose mothers were incarcerated, and found that 70% exhibited poor academic performance. Some studies of parental (father or mother) incarceration suggest that children whose parents spend time in prison are more likely to exhibit antisocial behavior, be involved with the criminal justice system as adolescents, and be incarcerated as adults compared with children who do not experience parental imprisonment. Murray and Farrington (2005) analyzed antisociality and delinquency data from the Cambridge Study in Delinquent Development, a longitudinal cohort of 411 London males and their parents. They compared boys who experienced parental incarceration any time from the age of 10 or younger with four control groups (boys who did not experience separation from their parents; boys who were separated from their parents by hospitalization or death; boys who were separated from their parents for other reasons, such as family discord; and boys whose parents were only incarcerated before their birth). They found that parental incarceration up through the age of 10 predicted severe antisocial-delinquent outcomes up to age 32 compared to the four control conditions, even after controlling for a number of other childhood risk factors. Murray, Janson, & Farrington’s (2007) analysis of longitudinal data on 15,117 Swedish children collected as part of the Project Metropolitan study generated similar findings: children who experienced the incarceration of a parent from the age of 6 or younger were more than twice as likely to be convicted of a criminal offense between the ages of 19 and 30 compared with children who did not have a parent incarcerated during early childhood. Children who experienced parental incarceration at age 6 or younger were more than twice as likely to be involved in the criminal justice system as young adults. It remains an empirical question whether the association between parental incarceration and negative child outcomes reflects a causal relationship. An analysis of data from an Australian cohort enrolled at birth and followed through age 14 found a significant association between paternal incarceration and negative child outcomes including substance use and internalizing and externalizing behavior (Kinner, Alati, Najman, & Williams, 2007). However, when socioeconomic status, maternal mental health and substance use, parenting style, and family adjustment were controlled, the associations became non-significant. Such findings highlight the uncertain status of the literature regarding whether parental incarceration itself leads to negative outcomes or is a marker for other background factors that erode child well-being (Phillips, Erkanli, Keeler, Costello, & Angold, 2006; Kinner et al., 2007; Hairston, 2008).